The mining town of Xenotime has seen better days. Once renowned for its skilled goldsmiths, it now lies forgotten in a sea of sand, its mines empty and its fields barren. 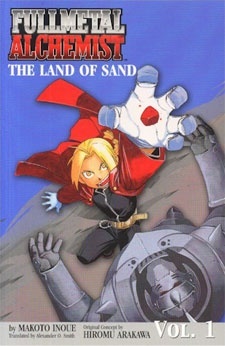 The townsfolk's only hope lies with the talented state alchemist Edward Elric and his brother, Alphonse. But who is the real Edward Elric? When the Fullmetal Alchemist and his brother arrive in Xenotime searching for the Philosopher's Stone, they discover that two strangers have stolen their names and their reputations! Will the real Elric brothers set things right, or will the battle between the true and false brothers shatter Xenotime's only chance for survival? Plus a bonus story, The Phantom of Warehouse 13! The novel was adapted into an anime in 2003 with episodes 11, 12 (main story) and 37 (bonus story).